but I have been posting on Fanfiction.net. Again I'm so sorry its sad and I should have probably said that is Tragedy but i think its more Hurt/ Comfort. It had been nearly a month since they had returned to Camelot. Merlin and Arthur sat on one of the turret building looking at the dark sky above. The month had been one of the best of Merlin’s life, Camelot was at peace, and he had used the last of his magic to make sure it was kept that way. Being court sorcerer meant that Merlin had to stay at his King’s side, however didn’t have to do the chores he detested. Arthur sat watching the stars as the breeze played with his hair. It was a beautiful mid summer night and Arthur, looking over the candle lit kingdom with his best friend besides him, realised why they were calling it the ‘Golden Age.’ He smiled to himself, Merlin and Arthur had become close, closer than they had ever been; the bond between them was strong, with no secret in the way, Arthur made sure they spoke about everything. The knights had accepted Merlin’s magic just like Arthur had, apprehensive at first, but seeing Merlin’s loyalty to his king could not hold a bad word against him. Gwaine was still saying that he had always known about Merlin’s magic, and as Arthur started thinking about it, he had noticed the narrow escapes. He blushed, as he realised he always thought it as providence or an angels listening to his prayers. He chuckled to himself as he looked at his best friend, Merlin the guardian angel. “What you laughing about.’ Merlin asked sleepily as he rested his head on the raised stonewall. “I know,” he said seriously. Merlin had finally told Arthur everything after he had threatened, half jokingly, to put him in the stocks if he did not tell him about the magic over the last ten years. Hearing about his father’s death had been the hardest part, but he understood, Morgana had always been one step ahead of them. Merlin was not to blame about the amulet; Arthur could also see how devastated the man was even after all these years. Following that long night Arthur had made magic legal over his kingdom and embraced the druid’s friendship. Camelot was truly shining in its Golden Age. The wizarding world was standing with Arthur, they were behind him and Albion was truly united. The bell chimed midnight as Merlin yawned. They had been with Gwaine and the other knights in the tavern. After a few hours of mindless chatter and some magical party tricks from Merlin, where the whole tavern had joined in the excitement, Merlin began to feel lightheaded with joy, people where cheering him for something that had always kept repressed and hidden. He had laughed with the rest of the knights and his king suddenly realising how content he truly was. He had told Gaius about the sacrifice and although his mentor kept looking for anything to help, Merlin already knew it was useless. At that moment though he didn’t think about what was coming, he hadn’t been this content and carefree since…. Well ever. He had his friends and magic was free, he had achieved his destiny. Magic was accepted and the druids would work with Arthur to keep it safe, he had spoken to them as Emyrus just to make certain. Merlin awoke early the next day and went downstairs to get the King and Queen’s breakfast. The sun was still rising above the mountains around the kingdom. It was going to be another beautiful summers day. Merlin hummed as he made his way back to the Kings chambers to find Peter, Arthurs new manservant, running past him, who froze staring at Merlin with the tray in his hands. “Again?” Merlin asked with a raised eyebrow, but at peters weathered look he grinned. “You go to the kitchen and get yourself some breakfast I don’t mind giving Arthur… I mean the King, his Breakfast.” He remembered when he had started the job all those years ago and how hellish the mornings could be. 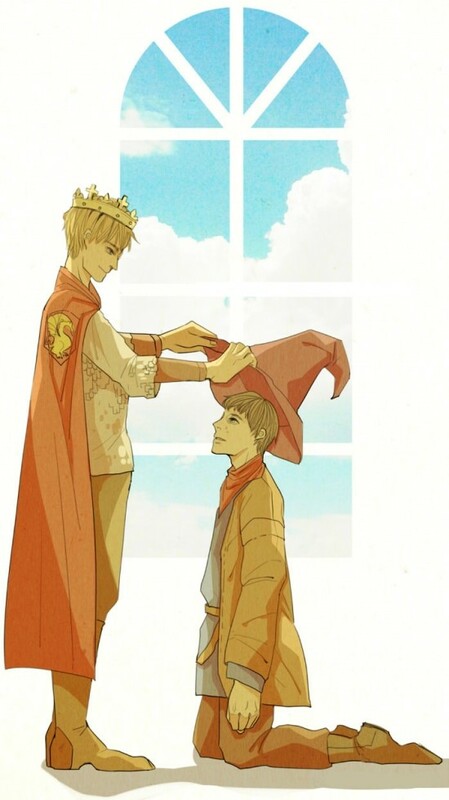 “Merlin, Thank you,” Peter grinned and then without even thinking about he bowed to Merlin. Merlin stared but Peter just ran off towards the kitchen. He kept reminding himself that he wasn’t a servant anymore, but court sorcerer who slept down the hall from the King. As Merlin barged through the Arthur’s doors and noisily placed the King’s breakfast on the table, Gwen smiled. Peter was great but it was nice to wake up to the sound of Merlin rustling around the room, while her husband grumbled abuse into his pillow. Merlin drew back the curtains and streams of sunlight illuminated the bedroom, “Merlin!” the King wined. “Yes sire?” he answered innocently. Gwen chuckled softly to herself as she gracefully left the bedroom to find her lady maids. After being Queen for five years she had finally become accustomed to being doted on, however she still liked to mend her own clothes and help Arthur whenever she could. She would not let herself be completely waited upon; it was not in her nature. Arthur was secretly glad to find his Manservant, he meant, court sorcerer, waking him up. It had been their routine for ten years and Arthur missed it. He made sure that he kept Merlin close at all times, so not much had changed however the morning wake up calls were no longer by Merlin, but Arthur was glad to find him grinning wickedly as he opened the curtains wider to let sunlight stream over the bed. When Arthur was finally dressed and eating with his wife, he pulled out a chair for Merlin, an invitation to sit down. Merlin looked startled at first but then tentatively took the seat next to the King. Arthur pretended not to notice the hesitation, however as Gwen spoke to Merlin about her day, Arthur thought about all the times he had wished he had shown his friendship a little more to the man who sat beside him grinning at the story Gwen was telling. Merlin had felt fine the last month, and wouldn’t have thought that his time was nearly up unless he had kept track of the days rushing past. He tried to cling to every memory and sitting with Arthur and Gwen as the sun illuminated the room was definitely one he would cling on to. As Peter came in to clear away the empty plates and Merlin followed Arthur down to the practice field he began to feel a burning sensation in his stomach. At first he tried to brush it off, however it grew worse and his vision began to black around the edges. He gripped the wall as his body instinctively curled upon itself. He couldn’t think anymore as the pain traveled to his chest and he coughed violently. Arthur was grinning widely and they made their way to find the rest of the knights. He couldn’t remember smiling as much as he had over the last month. Merlin stopped abruptly and Arthur turned to make a jibe, but his smile fell as he saw his friend hunched over himself, gripping the wall for support. His face was screwed in pain and Arthur could see that he was shaking. His mind went blank in horror. Merlin had been fine they had been laughing a few minuets ago, but as Merlin coughed splattering blood on the wall, Arthur realised the calm, which had descended had finally given away to the storm.